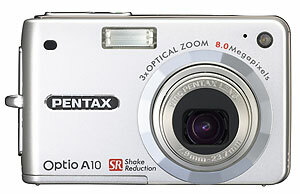 Digital Camera Review: The Pentax Optio A10 is a nice compact point and shoot, but to get the best results with the images, you’ll need to adjust some settings. I found the images to have oversaturated colors, and to be consistently underexposed. Also, the multi-segment light metering mode was challenged by some lighting conditions. As I mentioned in the above sections, all of these issues can be adjusted in the camera – turn down saturation, turn up the exposure compensation, and change the metering mode. However, in a market where a lot of people don’t use cameras to their full potential, the default settings should be a bit more acceptable, so people can take good shots out of the box. The battery life was unimpressive as well. The Shake Reduction mechanism was very good and the A10 is probably one of the cheaper cameras that includes this advanced feature. The images also showed good detail and sharpness. Digital Photography Review gives an above average rating and concludes that the Optio A10 is a deeply frustrating camera for a reviewer; on the one hand it is capable of producing some of the best results in its class, the lens is obviously excellent, image processing is fairly subtle, and unlike so many similar cameras the default contrast, saturation and sharpening are spot-on. On the other hand it can be really, really annoying to use; by today’s standards shooting feels slow and unresponsive, and has a screen that can’t be seen at all in bright weather. Throw in the dismal battery life and total unsuitability as a social ‘party snaps’ camera and you’d think this was a camera you’d only recommend to someone with a masochistic streak, or someone you really didn’t like.